Although there have been numerous publications that argue the merit of Chinese rule over Tibet, and many more that argue for Tibetan self-determination, the world has not heard many Chinese voices supporting the latter view. This book exposed the reader to just that perspective from no less famous writers and activists than Wei Jingsheng, Yan Jiaqi, Shen Tong, Wang Rouwang, and others. Though theirs is the view of a small minority of Chinese, history may still record the publication of these essays as a milestone in the history of this issue. 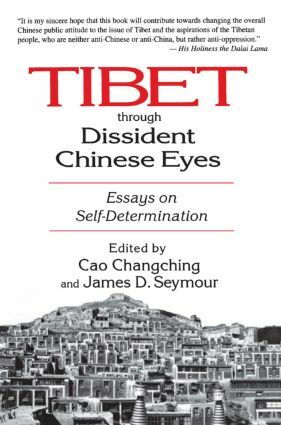 Independence - the Tibetan People's Right, Cao Changching; Brainwashing the Chinese, Cao Changching; Tibetans' Rights and Chinese Intellectuals' Responsibility, Ding Ziling and Jiang Peikun; Tibetan Chinese and Human Rights, Fang Lizhi; Tibet - An Unavoidable Issue, Shen Tong; Some Reflections on the Seventeen-Point Agreement of 1951, Song Liming; The Status of Tibet - Recalling a Visit to Lhasa, Wang Ruowang; A Letter to Deng Xiaoping, Wei Jingsheng; My View on the Tibet Issue, Wu Harry; Independence and Unification, Xiang Xiaoji; Ripple on the River of History, Xue Wei; Federalism and the Future of Tibet, Yan Jiaqi; Two Focuses of the Issue of Tibet, Yiu Yung-chin.